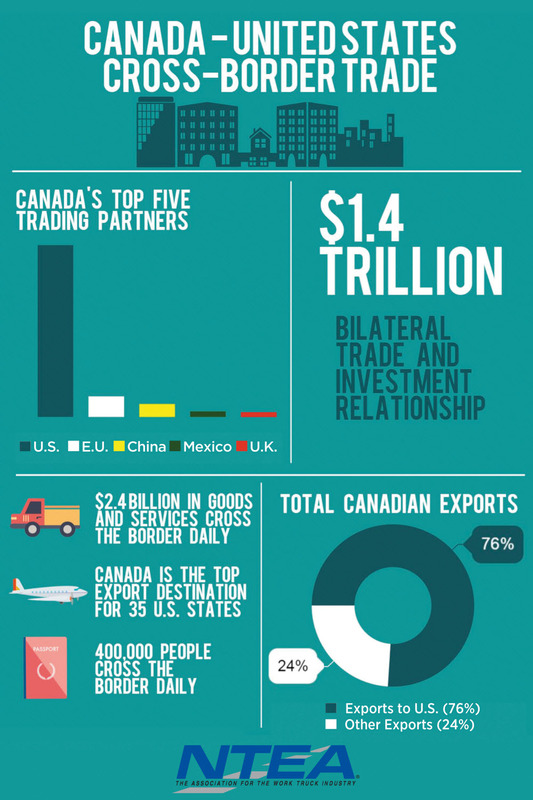 Canada and the United States enjoy the world’s largest and most comprehensive trading relationship, valued at $1.4 trillion in bilateral trade and investment. Each day, 400,000 people and $2.4 billion in goods and services cross the Canada-U.S. border. Twenty percent of Canada’s gross domestic product comes from goods exported to the U.S., while Canada is the top export destination for 35 U.S. states. Beyond strong economic ties, Canada and the United States share a long history of shared values and interests. The North American vocational truck industry is a good example of the interconnected nature of the two economies. Each day, companies of all sizes in the work truck industry are moving people, parts and products across the border in both directions. Many have operations in both countries. Strong North American integration helps companies compete in the global market place. NTEA plays a pivotal role in educating decision-makers about the North American work truck industry and advocating for harmonized standards between the United States and Canada. Both governments have been open to hearing work truck industry interests and concerns. If you're not yet a member, give us a call at 800-441-6832 or email info@ntea.com for more information. If you are a member, we'd love to hear from you, too.